*Some countries have a black market currency exchange which offers much better rates than the official ones (e.g. Argentina), bringing cash might be a better deal. Also check if credit cards are widely accepted at your travel destination, cash might be the only option to pay. Comparing annual fees is easy, but what most people forget is the conversion fee. When you make a payment in a foreign currency, all banks use the same exchange rate obtained from the ECB (for European cards). But most banks also add a conversion fee (also known as ‘foreign transaction fee’) which may vary from 1% to 3%. Make sure to use a credit card which doesn’t have a conversion fee or at least a card with a low conversion fee. You might have heard the question before: “Do you want to pay in local currency or your home country currency?” Always decline the offer and make sure you are charged in the local currency! Shops, hotels and restaurants offer this option so they can apply “Dynamic Currency Conversion” which is basically a SCAM. The payment processor will convert the local currency to your home country currency but will add a conversion fee which can be as high as 10%! Much higher than the conversion fee (if any) of your credit card…a nice extra for the hotel, restaurant or merchant. Paying in the local currency is always cheaper. In general, credit cards offer a better deal than using a Maestro debit card when withdrawing foreign currency from an ATM. Most credit cards charge an withdrawal fee which may be a fixed amount or a certain percentage of the amount you withdraw. Select a credit card which has no ATM withdrawal fee (or a low one) and don’t forget the conversion fee. Never accept an ATM’s offer to convert the foreign currency to your home country currency, this is the Dynamic Currency Conversion SCAM. Some ATM’s might also charge an additional fixed ATM fee on top. Do your research online and check which banks have no (or low) ATM fees at your travel destination. Finally, if your credit card has a fixed ATM withdrawal fee (e.g. €5) make sure to withdraw all the cash you need for the trip, instead of making multiple smaller withdrawals. For non-euro payments, I recommend the BKCP Visa Classic (update January 2017: this card is no longer available) and Belfius Mastercard White cards as they offer the lowest fees on the Belgian market. The BKCP Visa card is best for travellers who spend and withdraw foreign currencies several times a year. If you spend less than ~€4000 in foreign currencies per year and don’t withdraw money from ATM’s using your credit card, the Belfius Mastercard might be a cheaper option. Keep in mind you can also use the cards for online purchases in foreign currencies! For euro-payments, I recommend the Brussels Airlines Premium American Express card. As you probably noticed, the conversion fees and ATM withdrawal fees of the American Express cards are insane. You can avoid them by using the card for euro-payments only. There’s also a high annual fee, but this is compensated by a number of insurances which come with the card and the fact your earn valuable miles per euro spent. Applying for the Brussels Airlines Premium American Express card earns 12,000 miles! More details on how to request the card in my Brussels Airlines American Express blog post. Anything to add? Please share your experiences in the comments of this post! Thanks. 1) If your creditcard is opened up for payments in the country you are visiting. To check with your bank or cc company before your departure. Anyhow I thought this was usefull and thanks again for the great review! Thank you for the valuable input Tom! I personally use Visa/Mastercard of Beobank. You don’t need a bank account with Beobank, the annual fee is 0 or 5 euro and…they give a cashback of 1 pct! I use it since several years and never had problems. PS In 2012 Beobank was sold by Citibank to Credit Mutel Nord Europe. Thank you for your input Jos. The Beobank cards have a 2,39% conversion fee for non-euro payments. ATM fees: euro withdrawals 2,50% (min. €5, max. €15) non-euro withdrawls 2,50% (min. €5, max. €15) + 2,39% conversion fee. Cashback is limited to €200 per year. Would think twice before using this card for non-euro payments or ATM cash withdrawals! I would like to stand up for the Europabank Mastercard, which is my personal favourite to pay in a foreign currency. The card doesn’t have an annual fee and conversion fee is 1.19%. This is admittedly slightly higher than the Belfius Mastercard (1%), but in contrast to the latter you can link it to any bank account. I try to avoid withdrawing cash at all costs anyhow. I went to London and Zürich lately without exchanging a single Euro. Hi Migu, the Argenta MasterCard has a 1,50% conversion fee. Bart, what about the Argenta bankcard ( Cirrus) to withdraw money outside Europe? MasterCard, Maestro and Cirrus are part of the same network. As indicated in ‘update 1’, the Argenta debit card might be interesting for cash withdrawal outside the euro-zone, but make sure to activate it for non-EU use at your Argenta agency. Thank you for your input Steeve. As indicated in my blog post, some countries might offer a better deal exchanging cash. However, I didn’t expect Thailand to be one of them. Can you be a bit more specific with an example of a transaction you did vs what the rate would have been using an ATM debit or credit card with no fees? Can you also indicate the brand of the exchange office(s)? Are we talking about superrichthailand.com? 2 weeks ago I was in Bangkok. The exchange rate for bank notes at Super Rich Bangkok was 1 euro = 38,1 Baht. For the ATM I use my Debit Card (Maestro) from a Dutch bank. The exchange rate will be the Mastercard Exchange Rate minus 2% commission. (See Mastercard currency conversion tool via Google). This rate was that day 1 euro = 37,7 baht. Minus commission this will be 36,946. The Mastercard Exchange Rate is for everybody the same, the commission is different per bank / type of bankaccount. Next to the commission my Dutch bank will charge €2 fee for every ATM transaction out of Europe. The Thai ATM will charge 180 baht for every transaction foreign cardholder (impossible to avoid). At the ATM in Thailand: (250-2) * 36,946 – 180 = 8982,61 Baht. Difference: 542 Baht / 14 Euro per ATM-transaction! During a normal holiday I have to go several times to an ATM so you can save lot of money. The best rates are offered by SIA Money Exchange or Super Rich Head Office Radjamdri and only if you use 100 Euro banknotes or higher. 10/20/50 Euro banknotes will give lower rates.Super Rich offices at the Skytrain Stations are giving lower rates. At Super Rich Exchange it will be busy and you have to wait long time in line. TIP: the money changers around Super Rich give the same rate but no other people waiting (example Power Exchange). Excellent input Steeve, will try it on my next trip to Bangkok. Thanks! Actually, the 180 baht ATM fee can be avoided. Surprisingly, Citibank is currently the only bank not charging this fee at its ATM’s in BKK. It has branches in Sukhumvit (across Terminal 21) and Silom. WOW! That’s a fantastic tip, thanks Olaf. I was in Thailand last week and discovered that I could only withdraw 620 euro in 4 days with my (KBC) Visa card. After checking on the internet, I discovered this limit applies to all/most banks? Luckily I had another (Indonesian) visa card as I really needed the cash. Does anyone knows if there are credit cards with no cash or higher cash limit? You should really try to exchange cash in Bangkok. Don’t forget to take the “bigger” 100-Euro banknotes with you for a good rate. Never change at the airport. Be extremely causcious with changing money on the street or with unaffiliated agents. Always recount the money in your own hands, and make sure that the seller does not touch it anymore. Recount it by yourself even if you have seen that the agent counted it before your eyes. Bali, and many other places, are full of money changers with extremely good sleight of hand. They will very explicitly count the money on the counter before your eyes. Everything looks fine. They will recount it, on the counter, before your eyes, just to make sure your are fully reassured. Next step is that they will put all bundles together, but by doing so, they drop half of the money behind the counter. Some agents are so good at this trick that it is impossible to see, even when you know the trick, and you are expecting it to happen. I was lucky to see it happen the first time and walked out, next I tried it in 2 other places where the same practise happened but I could not see it happening. Nevertheless they shortchanged. It can be a very expensive magician show. Thanks for your insights PhBRU! When dealing with the ‘black market’, like in Argentina, remember to take brand new notes with you. Preferably in 20 or 50 American Dollar or 20 or 50 Euro. Crisp, unfolded notes that look like they’ve just been printed by a central bank are by far the easiest to exchange. Also remember: ‘black market’ sounds much more scary and illegal than it actually is. In Buenos Aires there’s a street called Florida Street, which is not only a main shopping street but also the ‘headquarters’ of the black market. You’ll find a lot of people there, including merchants, who are more than interested to ensure their savings and pension from the high inflation and unstable economy by turning Pesos into Dollars and Euros, making it extra interesting by giving excellent rates: sometimes up to 1,5 times more than a bank or official exchange booth would get you. Of course, just pick someone who is or looks reliable. I have had a few good deals with one of the flower merchants there. Thanks for your input Arne. I had similar experiences in Myanmar where they also expect crisp unfolded notes. Used Revolut during my recent trip to Australia and I think it’s brilliant. You immediately see how much you have spent in your ‘native’ currency. The only downside is that you can only use bank transfer to top up from Belgium; Belgian debit cards are not accepted for some reason. Thanks you for your input Thomas. Hope you have great time in Australia! Fully free card that is MC and Maestro, has NFC, no foreign transaction fees and has an awesome app. Thank you for your input Ben. Will have a look at it! I would like to add that the Argenta Mastercard is also completely FREE. No annual or other charges whatsoever. I have already used it in the UK and the US several times and have so far not had any problems with it. In the US I have not yet found an ATM without a charge for a cash withdrawal. But they vary from $2 to $5 or even $6. I am yet to try withdrawing cash with my debit card. Know that in the US you can ask for cash with your purchase at the cash register in most all supermarket chains (just as most of us are used to doing in Belgium). I have done that multiple times already, without any problem. And last but not least, in the US cashiers will often ask you if you want to pay debit or credit if you pay by creditcard. So even with a credit card you can pay “immediately”. Thank you for your input and feedback Marijn! Update: As indicated by Olaf, don’t forget the Argenta Mastercard has a 1.5% conversion fee! As a matter of fact, the Argenta MC nowadays incurs a fixed 4 EUR transaction fee as well as a conversion fee of 1.5% when withdrawing money outside of Europe. You’re better off using Argenta’s Maestro card when you’re abroad (see also Bart’s update 1). I’ve been using it all over Asia in the last ten years and can indeed confirm that it’s free. You seem to be a big fan of the Brussels airline AMEX card. I noticed that most shops ask for a fee when using AMEX cards. Mastercard is most of the times for free or at least cheaper than AMEX. Is the earning of miles so much more interesting than the extra costs to do all euro payments with these cards? I also used my Argenta Maestro card to withdraw cash at ATM’s when outside of Europe rather than change cash in a bank but last month I tried twice to withdraw cash from an ATM in San Augustin, Colombia. It did not work, I got a slip confirming that the operation as interrupted but when coming home I noted that the money was taken from my account anyhow. Filled out a complaints form from Maestro but have little hope to see my money back. In future, I am never going to use my Maestro card outside of Europe again but rather change cash in a bank again. Maybe exchange rate and costs are a bit more expensive but you do not risk losing it all as with Maestro. Thank you for sharing your unfortunate experience Freddy. Did you keep the slip confirming the transactions was interrupted? Maestro should refund you the money in that case. Please keep us updated on the outcome of your disputed transactions. Thank you. Yes, I did keep the slip and added it to my Maestro complaints form but of course the Colombian bank can always claim that after 2 unfortunate attempts I did manage to withdraw the cash afterwards. The problem with Maestro is that you have to give your PIN code whilst trying to take cash from the ATM so the bank has your PIN code and thus, in practice, full access to your account, within the limits of your Maestro card of course. Within Europe, this may not be too much of a risk (although) but when dealing with a bank on another continent, in my case a Colombian bank, I am skeptical that Maestro will, either get the collaboration of the local bank or is prepared to invest time to go through the hassle of verifying the exact time of my claimed withdrawals and compare it with the time on my slips. Anyway, I’ll keep you posted. Thank you Freddy, good luck with the complaint. Fingers crossed! Great news, ATOS reimbursed the amount of the failed withdrawals to my account. So, based on this experience, I can underwrite your message that withdrawing cash with a Maestro card is indeed the cheapest solution. I also use a Argenta Maestro card in order to minimize costs. That’s excellent news Freddy! Thank you for sharing your experience. Could you kindly explain what you mean by “credit cards offer a better deal than using a Maestro debit card when withdrawing foreign currency from an ATM”. I always thought that withdrawing money with a maestro debit card was always a better option than credit card. Hi Julia, most banks charge extra fees (e.g. 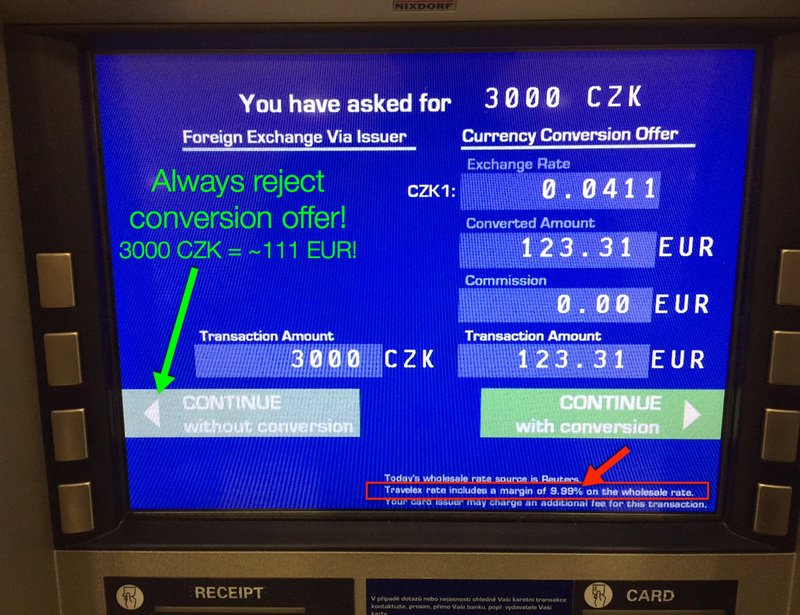 conversion fee) to withdraw foreign currencies using your Maestro card. The only exception in Belgium is Argenta, who doesn’t charge any extra fees. It seems that except the 5€ annual cost and the 1% conversion fee, there’s any extra fee for non-euro payment and cash withdrawals..
William, correct, this card might not have a conversion fee for non-euro payment and ATM withdrawals. However you need to be very careful to avoid the card issuer automatically enrolls you in a ‘credit’ program with high interest rates. I have asked a chargeback for an hotel reservation which was paid in full and cancelled by HotelsClick before staying at the hotel. HotelsClick cancelled the reservations not only of me but of every customers because they didn’t paid the hotels. Then they went bankrupt. American Express Belgium refused the chargeback because the reservation was not cancellable! I’m going to open a claim to the Judge of the small claims. What do you think Bart? P.S. Sorry if off topic. Hi Rosario, that’s indeed not a pleasant experience and not the service level you would expect from American Express. I don’t know the exact details of your case, so hard to determine what exactly causes Amex refusing your claim. I assume if you persist and clarify the case, a solution should be possible. Feel free to email me at bart@bart.la with more details. Hi Bart, thanks for your reply. I’ll let you know what will be the decision of Amex after my claim againt their first decision. In case I’m determined to bring the issue to the small claims court. I don’t know why they accepted the claim concerning the refundable reservation and not the other claim on the non refundable reservation: in both cases it was the provider which cancelled the reservations and not me. Hi Bart, In the end the problem has been solved. I have contacted the Amex complain office which re-open the issue with the charge-back office and so I have finally received the charge back for the room I have paid but that the travel agency cancelled because of financial problems with hotels. Thanks for the follow-up Rosario. Great to read the issue got resolved!